Rini got her master’s degree in Inter Asia NGO Studies from SungKongHoe University in Seoul South Korea and her bachelor degree in Psychology from Universitas Syarif Hidayatullah Jakarta. Rini is a Program Administrative Officer. She is in charge on the administration matters of all SMERU’s programs; ranging from core funding projects, multi-years projects to small incidental projects. 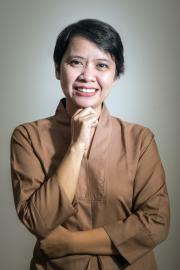 Prior to joining SMERU, she was a Program Development Coordinator at Transformasi untuk Keadilan INDONESIA.